Welcome to "Newtown News Update"! If you are not a subscriber, please subscribe here. If you are a subscriber and do not wish to receive further updates, please use the "Unsubscribe" link at the bottom of this email. Newtown Township Manager Kurt Ferguson presented his recommended 2018 budget to the Board of Supervisors on October 16, 2017. Ferguson noted that the “Township continues to face shortfalls. This does become more prominent as we continue to face capital expenditures that we need to make to maintain the level of service our residents have come to expect,” he said. To compensate for those shortfalls – due mainly to the decrease in Earned Income Tax (EIT) revenue when Lockheed Martin left town – Ferguson recommended the implementation of 2 mills tax increase (.ie., property tax increase) being assigned to the general fund. 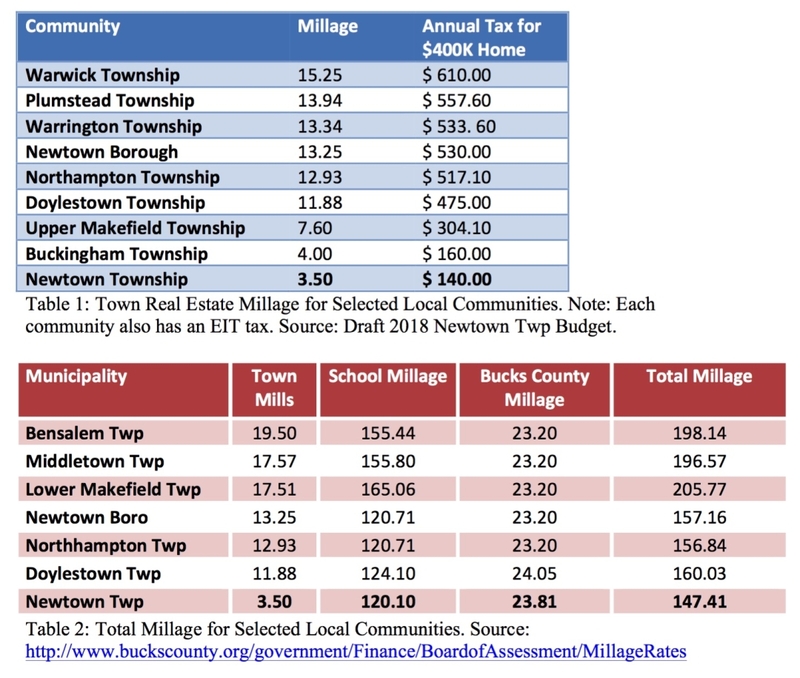 In the past, Newtown Township has been able to enjoy a much lower millage rate, as compared to most of our neighbors (see Tables 1 and 2). According to Ferguson, “there is currently zero mills being dedicated to the general fund. With a current Township wide assessment of $344,418,300 those 2 mills would generate an aggregate total of $688,837,” he estimated. At the October 11, 2017 Board of Supervisors meeting, the Newtown Ambulance Squad requested the re-instatement of the 0.5 mill EMS tax. Read more about that here. The last summary of results was published (here) on September 13, 2017, when 100 responses were collected. Water Quality, Open Space, School Safety, and Drug Abuse remain the top 4 concerns of residents, in that order. While the Township Supervisors mull over Mr. Ferguson's recommendation to increase taxes, “Keeping Taxes Low,” however, moved up to the #5 slot with 52% of respondents saying this is “very important” to them. Previously, only 35% of respondents considered keeping taxes low as very important. Meanwhile “Attracting New Business” dropped to last place with only 36% of respondents considering this to be “very important.” However, that is still very close to the 39% reported in September. YOU ARE INVITED with your neighbors to meet our Democrat local, county and state candidates and officials. Wine and appetizers will be served.